My Blog candy for this Ball is very sweet! I hope you all had a "Ball"
I love your card and the purple is perfect! Already a follower. Ahhhh i so want a taste of the cupcakes,,,,they look sooo yummmmmmmy.. Beautiful job. TFS! I love the colors you used! Thanks for sharing! This is a fun way to celebrate Theresa's birthday. I'm already a follower. What a beautiful card..cupcakes look delish. Of course, you have a Monkey following you! What a beautiful card!!! The cupcakes are a perfect accessory to go with it!! They look soooo yummy!!! I love that the wrappers match the card! Thanks for sharing and thanks for the chance to win!! Love the card and the purple frosted cupcakes. Very elegant card for her royal highness! Julie~ Your cupcakes look so YUMMY!! I bought the Easter cart last year to make cupcake wrappers but, still haven't tried it out yet. You have inspired me to get the cart out this weekend and try to make some for Easter. Thank you for your inspiration. Such yummy yummy cupcakes!!! Love the crown holders and the card is beautiful! TFS! Julie, your cupcakes looked so yummy on UStream I wished I was there to eat one. they looked so royal. 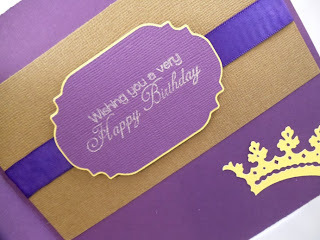 I loved the beautiful Cupcake wrappers you made with the royal colors of gold and purple and the purple cupcakes. Wow! Mahalo for sharing. 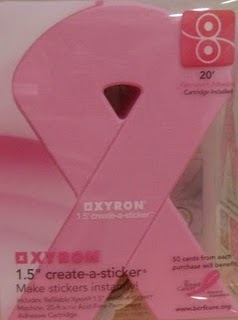 I love this Xyron. I use mine all the time and believe my old yellow one is my #1 tool. great card - love the layout and the colours. I loved your yummy cupcakes. Super cute! I am so bummed I missed the live ustream! We didn't get home in time! Your card is fantastic! Hmmm ... those cupcakes look very yummy. Love the wrappers and card. Scrumptuous, and great job!!! nice prize but i have one, if you do pick me make sure it goes to someone who needs it tyvm !!! Ohmigosh! Your card and cupcakes are AWESOME!!! I want one of those cupcakes so bad I can taste it! You did a really great job on everything and I'm sure Theresa loved it too. I forgot to add that I am already a follower and I have your blinkie posted at my blog (anniebeescraftroom.blogspot.com). Since you review comments, you can stop this one from posting, I hope. I didn't want to double post. Sorry! love your card!! TY for the chance to win!!! Such a great card I love the colors. These are gorgeous! I love the royal looking colors! Very nice work and I'm sure the queen and her royal quests are loving these! I just love love love your creations. TFS. I love the colors and cupcakes look so yummy!! Awesome cupcake wrappers, I think I want to eat it's contents. LOVE LOVE those cupcakes!! It was great seeing you on the Ustream last night!! Your card is totally ADORABLE!!!! Great card and I have to tell you I had to clean the drool on my keyboard last night! Do you know what that was like after 10 months on WW's? Oh that was painful! Love the royal cupcakes and birthday card! Great projects. I'm a new follower - thanks for a chance to win some blogcandy. I just love those cupcakes. They looked so good last night. TFS!!! So cute and GREAT colors! Those cupcakes look SO YUMMY! Thanks for the chance to win! Super Duper Cute Cricut Chick! So on my birthday, I would love for you to fly out and bring those delicious cupcakes:) TFS! You rock. Im a follower and I added you blog button to my page. These look amazing! I have never made wrappers before. You have inspired me. Love the vibrant colors:) TFS. Everything looks very regal and those cupcakes look very yummy!! Supper job on the card and wrappers. I bet the cupcakes were yummy. Thank You for sharing in the hop. Your card is elegant! Love the cupcake holders! Love the projects, those cupcakes look so yummy. TFS and thankd for the chance to win. The cupcakes look so yummy! I love the card- very elegant! The colors are beautiful. Thanks! Having a ball through this hop! I love your card and cupcake wrappers!!!!! Love the card and cupcake holders, purple is awesome! Yumminess! Super cute card too! Loving the hop and I am a follower! This is so fabulous! I love the cupcake holders!!!! What a sweet way to ring in the bday. I am starving after looking at your cupakes. What time is desert at the Royal Ball? Love your creativity. I love your project -- very regal! 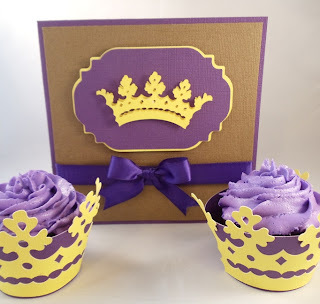 Very queenly card and love the cupcakes! Yummy!! Your card is perfect and the cupcake wrappers are beautiful! I love your card and those cupcakes look very yummy!!! Ooh your cupcakes are to die for! I love the color combination purple and gold. So royal looking. I am already a follower and will put your blinky on my site. Super cute cupcake wrappers!! Love it! 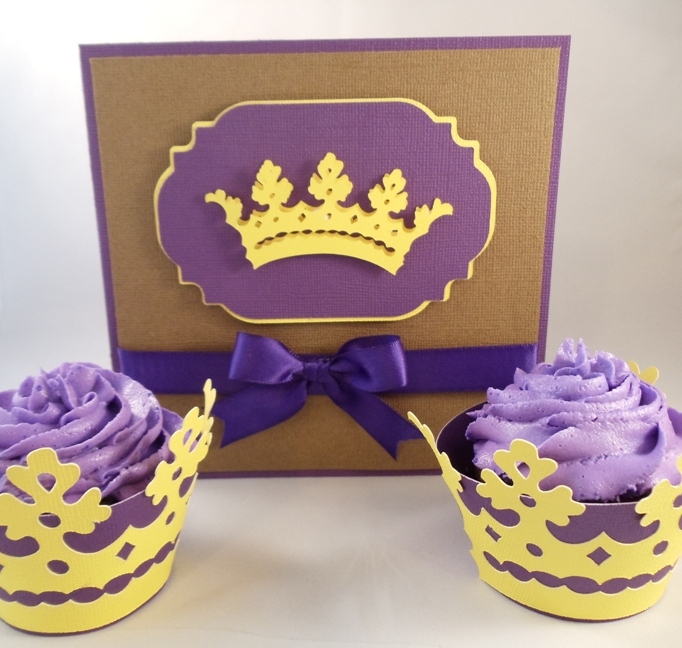 Great looking card and cupcake holders...the use of the colors yellow/purple/blue make everything feel regal. TFS. Love your card and cupcakes! They were oh soo yummy! I did share mine with my little princess, and she loved it too! It was great to meet you at the party! Thanks! Gorgeous card and those cupcakes look so yummy! I am having so much fun on this hop! I am already a follower and your blinkie has been on my blog for awhile now...love your blog! Great job on the card and the cupcake holders. The cupcakes look so yummy! Those cupcakes look yummy!Love they way you decorated the inside of the card! Purple frosting.......oh yummy!!! I love purple. The cupcakes holders are adorable and I'm lovin' that card. Very cute theme!!! Great card, Julie! What paper did you use for the crown? I am looking for some good metallic paper. While I like the DCWV Metallic stack it doesn't have the exact gold and silver I am looking for. The cupcakes look delicious! Very pretty card - and I love the cupcake holders! Thank you for sharing! It was great to meet you and eat your yummy cupcakes! I enjoyed your projects and your company. Oh I love your card and those cupcakes were AMAZING!!! My kids enjoyed them too! You truly are the queen of cupcakes, yum yum!!! I had so much fun hanging out with you. I am such a dork, I was trying to multi task and hop two at a time well I commented to you with on melanies blog. But I love your card it is so perfect and those cupcakes are AMAZING. They tasted so yummy and my kids loved them too :) You are for sure the Queen of cupcakes!! I had so much fun hangin out with you!! those cupcakes look as good as the did when the Queen was eatting one on Friday night! Just beautiful! It was nice to meet you at the U-Stream (or UP-Stream, depending on who you are)! I'm a new follower. Visit mine if you get a chance! http://www.flairandfrillscreativity.blogspot.com We can exchange blinkies! I am enjoying all these crowns and purples and golds! 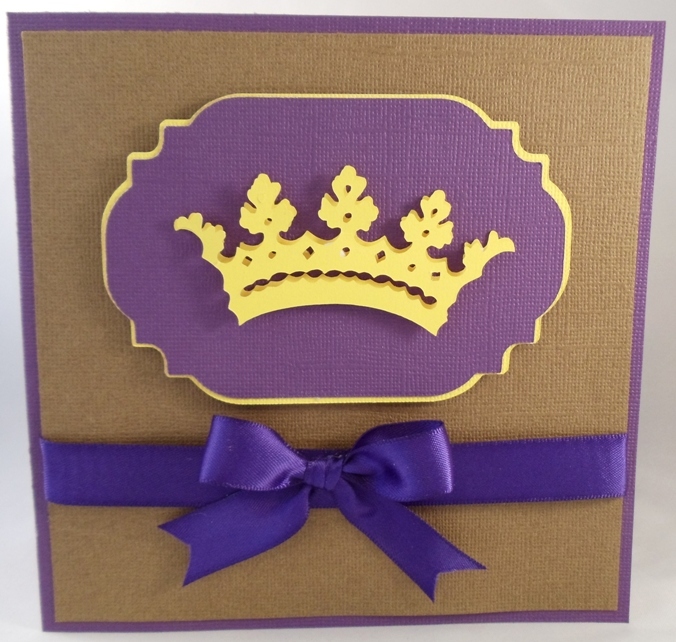 What a great card for such royalty! Cute project... Love the purple and the gold. The cupcakes look so yummy!! !Thanks for sharing!! Your card and cupcake holder are awesome! I love them both!